Growing up in West Texas in part of my early years, I certainly know what "thirsty land" truly is. The black dirt shrinks, leaving deep cracks in the ground. All the grass turns yellow, then brown, and then dies. A wisp of breeze stirs swirls of dust over the barren land. When the downpour finally comes, the "thirsty land" swallows voluminous amounts of water as the rain runs off the wet surface and finds its way into the deep cracks of the drought. The ground swells, the grass comes back to life, and life is replenished. 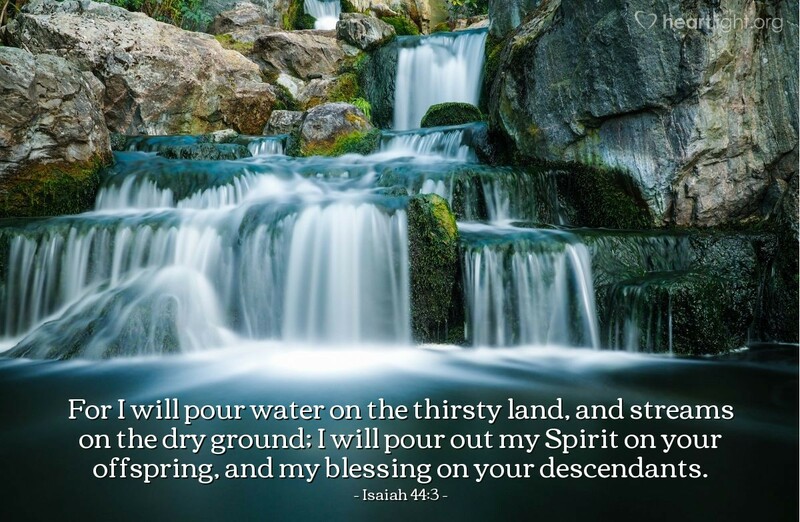 In a barren spiritual wasteland, God's Holy Spirit pours out his blessing, brings times of refreshment, and replenishes our thirsty hearts. Generous and loving Father, thank you for so many blessings you have poured into my life. Most of all, dear Father, thank you for the blessing of your presence, your strength, your grace, and your refreshment given to me through your Holy Spirit. In Jesus' name I thank you. Amen.